ON THE 7.4 MILE COURSE OF THE DIPSEA TRAIL, you’ll follow in the footsteps of hundreds of walkers and runners of the oldest footrace in America. The 109th annual Dipsea Race takes place this year on June 9, but you can follow the course — all of it, or a section — anytime you like. Your Dipsea route starts a few flat blocks from the Mill Valley Inn at the Dipsea Stairs in Old Mill Park, on a flight of 671 stairs in three separate sections. If you’re trying to picture what 671 stairs might feel like, it’s equal in height to a 50 story building. But with Marin’s beautiful nature surrounding you! It’s up and down from there — on hills and valleys called Dynamite, Rainforest, Cardiac, and Insult — until you reach the Pacific Ocean at Stinson Beach. It’s a real-life highlight reel of this amazing stretch of Northern California. If you’re a runner, you clock yourself against the fastest who complete the course in the annual Dipsea Race in well under an hour. For everyone else, we suggest you pack a picnic from Mill Valley Market and make a day of it. Leave early, and with lots of stamina if you plan to go both directions. If you want to end your trail adventures at Stinson Beach, take your time in this classic California Beach town before taking a car service or bus service back to Mill Valley. NOT ALL-IN? Do only part of the the trail, ending at Cardiac. 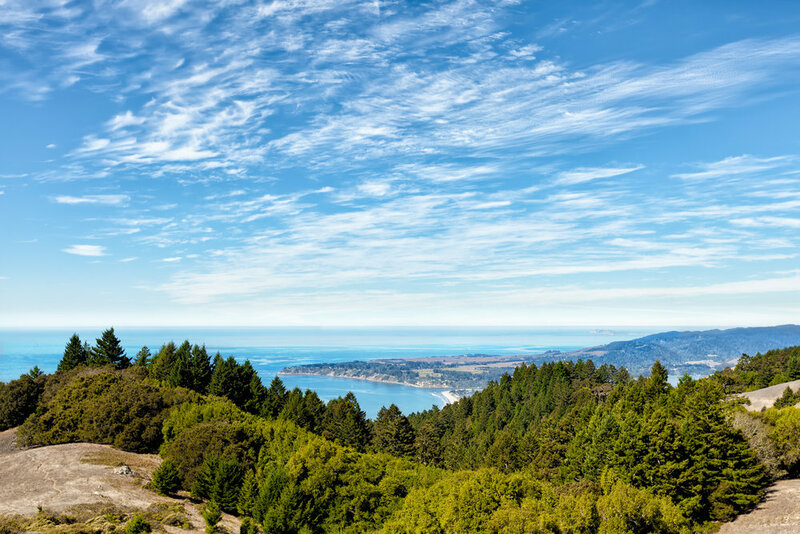 Have a picnic lunch at the 1350 feet elevation with the big blue Pacific view, and return to Mill Valley Inn knowing you’ve avoided the appropriately named Insult. Still a spectacular experience worthy of the sense of accomplishment that comes with a good hard hike. INTERESTING, BUT NOT FOR ME. Check out a flat hike in Marin County.